Structure: Last, First M. “Article Title.” Database Name. Database Publisher, Date Month Year Published. Web. Date Month Year Accessed. <URL>. Note: The footer shows that the source was published originally by the database. 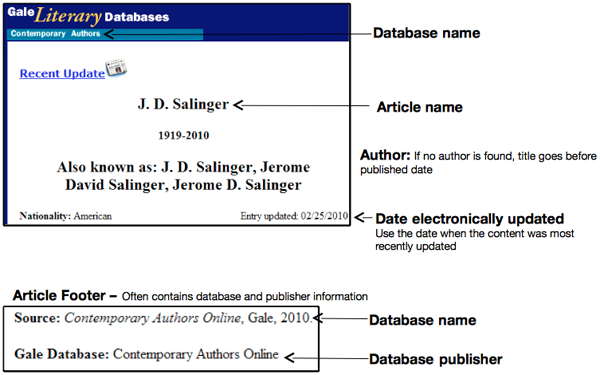 You can look for the citation of the article to give you an idea if the source was originally published elsewhere and then hosted by the database, or published by the database itself. Citation: “J. D. Salinger.” Contemporary Authors. Gale, 25 Feb. 2010. Web. 26 Apr. 2010. Structure: Last, First M. “Article Title.” Newspaper Title [City] Date Month Year Published, Edition ed. Database Name. Web. Date Month Year Accessed. <URL>. *City Note: Only include if city is not in newspaper title. Do not include if well known or nationally published. Citation: Anand, Geeta. Anand, Geeta. “Fire and Fumes Can’t Drive Indians from Hellish Village.” Wall Street Journal 2 Apr. 2010, Eastern ed. 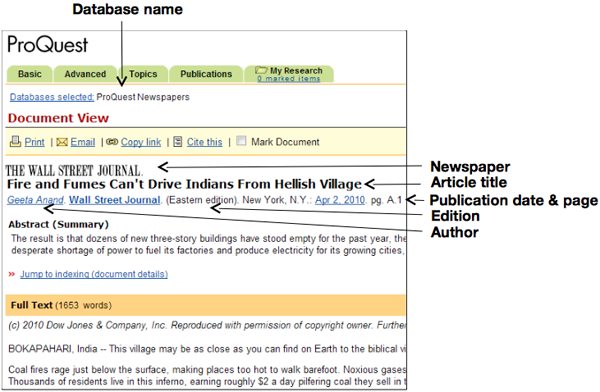 ProQuest Newspapers. Web. 5 Apr. 2010. Structure: Last, First M. “Article Title.” Encyclopedia Name. Edition ed. City: Publisher, Year Published. Database Name. Web. Date Month Year Accessed. <URL>. Citation: “The Holy Roman Empire.” Encyclopedia of World History: Ancient, Medieval, and Modern. 6th ed. Boston: Houghton Mifflin, 2001. Credo Reference. Web. 28 Apr. 2010. 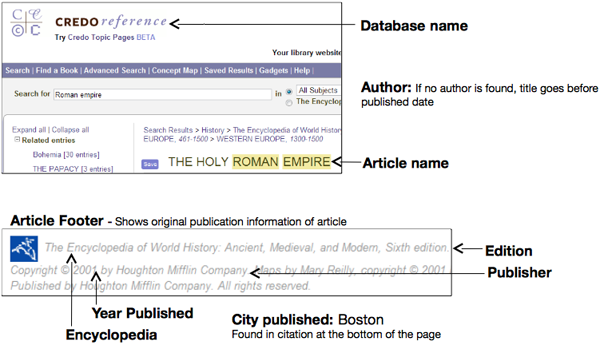 View additional citation examples on how to cite a database in MLA format.